Wallison's article was originally published by RealClearPolitics on May 13th. Wallison's writing is in italics; my responses are in bold. The Mueller investigation of President Trump has reached an impasse. We don’t know whether the investigation has reached an impasse. The special counsel wants to interview the president. The president’s lawyers -- well aware of cases in which prominent people have been convicted of perjury about their sworn statements instead of the crime for which they were being investigated do not want him to testify. They suspect a perjury trap. Wrong; the president’s lawyers are afraid he won’t be truthful if interviewed. but only that his recollection of an event or a conversation will differ from that of others whom Mueller has interviewed, or even differ from documentation in Mueller’s possession. Oh please. The president is a repetitive liar, so of course, they’re afraid of perjury. Possibly, but perhaps not if Trump is offered use immunity; see below. eventually reach the Supreme Court, and still not resolve any of the questions about Russia collusion or obstruction of justice. There might be resolution after that ruling and the procedure that follows. It’s a dream scenario for the resistance. Not entirely true. Delay is bad for everyone. Also, Mueller could proceed against others while awaiting such a ruling, which is what he’s doing now. This is absurd. We have a regular order in the criminal justice system to be followed by the parties, but it has been completely ignored in all the threats going back and forth in the media. Gamesmanship by all sides is part of the legal process. 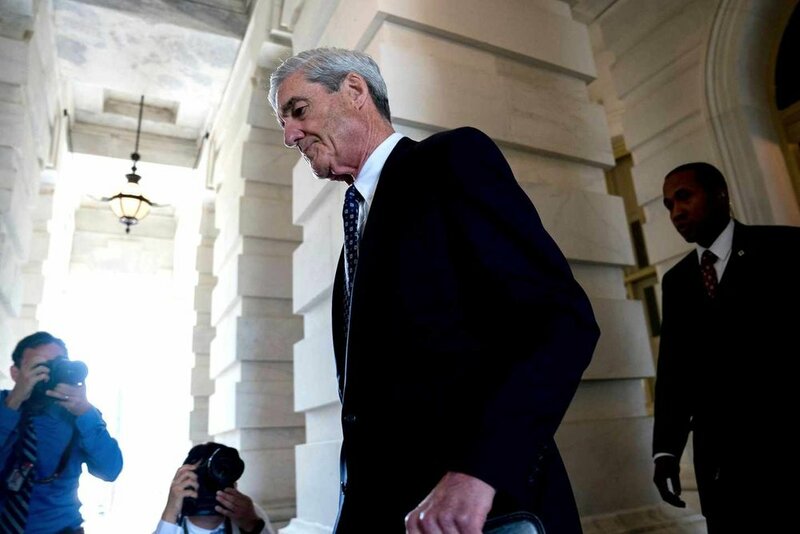 After a year of work, the special counsel and his staff have assembled a massive amount of information, but no one outside the Mueller staff knows whether he has any evidence that actually incriminates President Trump. In a normal criminal case, the prosecutor outlines the evidence to the defendant’s lawyer, and the lawyer and client decide whether to plea-bargain or go to trial. Of course, this case is different because of its political elements. If Mueller reveals his evidence to the president’s lawyers, and it is deemed weak, it will be leaked to the media, eliminating any leverage that Mueller might have to get the president to sit down with him. Not necessarily so. Mueller may have even more leverage after such a leak. We don’t know the content of the leak or the public reaction so we can’t know whether his leverage will be increased, decreased, or, as the author argues, eliminated. That’s a very dangerous option and it’s not even clear he can actually accomplish it. I would not call it a political option. It’s a desperate potential legal option. which could make the premature disclosure of evidence to the president’s lawyers inadvisable for the special counsel. Again, this is speculative. We don’t know what would be disclosed, what the president’s and his lawyers’ reaction would be nor what the public reaction would be. So the fact is that no one will know what Mueller actually has, and the standoff between him and Trump could go on indefinitely. No stand-off, if there is one, will go on indefinitely. Mueller has many options: proceed without Trump’s oral testimony, interview Trump, extend use immunity, serve subpoena, accept written answers to written questions, among others. I doubt that. I think Mueller knows much better than the president whether the president is vulnerable to prosecution. Mueller has evidence the president doesn’t have and Mueller is a better judge of the strength of that evidence. and more than anyone else he wants to bring this matter to a close and get on with his presidency. Trump could tell Mueller that he will not appear before a grand jury. True, he could say that. He could argue that, as the apparent target of the special counsel, he cannot be compelled to testify. No one, not just a target (and there is no clear evidence that Trump is a target) need testify if they exercise their right against self-incrimination. Wrong. This is not subject to debate. The right to not testify against oneself is unquestionable. but as a political matter most Americans would think it’s unfair to call the president to testify when the prosecutor in this case has had a year to develop his case. Absurd. The government often takes much longer to develop a case. What matters is the strength of the evidence. If a defendant murdered someone ten years ago, the length of a ten-year investigation would be irrelevant. What matters is: did he do it? If he does not have a case without the president’s testimony, then he should give up. Wrong. Mueller should do all he can lawfully to learn the truth. If the president pleads the 5th, Mueller could offer him use immunity whereby nothing the president says could be used against him, though the president still could be prosecuted for perjury if he lies to Mueller. It’s difficult to imagine that the president could or would resist testifying at that point. But maybe he would, as there’s not much normal about what he’s done so far. This is exceptionally absurd. First, most scholars believe the president can’t be indicted while in office. The president should never forfeit that defense. Second, a prosecutor can’t bring a prosecution based on a dare. He must have adequate evidence. Third, as noted above, Mueller has ways to acquire or compel the testimony of the president. It’s true that a prosecutor, as the saying goes, can “get a grand jury to indict a ham sandwich,” but this case is different. Uh, likely no. See above. and there is nothing the president might tell him in an interview that will change that. Maybe false. Potential defendants often convince prosecutors not to indict based on their explanation and answers to questions. It seems very likely Mueller has evidence that’s not public. indicting a sitting president on that basis would be a huge and career-ending embarrassment for him and his team. That’s speculative. We don’t know what Mueller has nor what the outcome of a prosecution might be.